Wedding PR: Honeybook, About.com, The Knot, and more! We hope everyone is having a spectacular Labor Day weekend! We are so happy to share another batch of client features, including Honeybook, About.com, The Knot and so much more! See it all below! 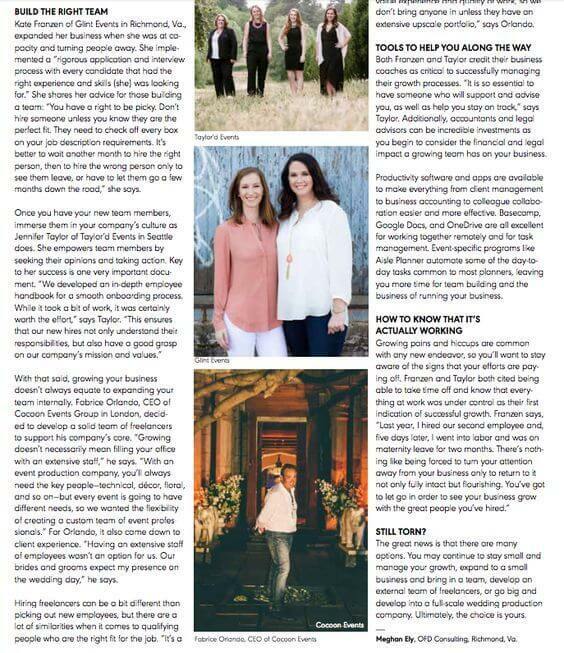 OFD Consulting, Cocoon Events Group, Taylor’d Events Group, and Glint Events were featured in Wedding Planner Magazine. Taylor’d Events, 100 Candles, Historic Mankin Mansion, and Fantasy Sound Event Services were featured in the About.com article Wedding Favors: Do’s and Don’ts. See the full feature here. OFD Consulting was featured on WeddingWire EDU with the guest article Partnership Marketing: Building Your Business from Your Wedding Buddies. See the full article here. Destination Weddings was featured on Wedding IQ with their guest article The Latest Trends: Why Educating Yourself on “What’s In” is Essential. See the full feature here. Wente Vineyards was featured in California Wedding Day with an Autumn wedding. See the full feature here. Taylor’d Events was featured on Special Events with their guest article Priorities, Priorities: Secrets to Knocking Out Those Long To-Do Lists. See the full article here. Destination Weddings was featured on Catersource in the guest blog Destination Wedding Cuisine Trends. See the full article here. Taylor’d Events was featured on Honeybook with the guest blog Finding the Value: How to Price Your Work and Know Your Worth. See the full feature here. Brit Bertino of WIPA was featured on The Knot in the article How to Deal with High Expectations After a Sibling’s Wedding. See the full feature here. Destination Weddings and Historic Mankin Mansion were featured on About.com in the article Eloping? Check Out This List of Do’s and Don’ts. See the full feature here.